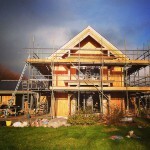 Our Solar PV is angled to optimise winter sun. It is fascinating to see how it performs, now that our daily cycle of sunlight is so short. Today was a great example. First day of sunlight, after 3 days of murky grey. Since our Solar went live in September, we have run our LPG Generator three times. And the first two times were nothing to do with batteries getting low. Our inverter charger (the Sunny Island, by name!) does special battery conditioning charges. During one of these ‘Boost’ charges, the sun went behind a cloud for the last 30 minutes of that charge and it didn’t finish. This happened for two days, so finally, we switched on the generator to finish it. The third one, we decided to not trust the weather and did a full charge overnight, taking about 5 hours. The next day was sunny all day and we realised we could have waited and the sun would have done that for us. But that was October, not December, two days away from the winter solstice. And what do our lovely solar panels provide us with, on such a winter’s day as this? 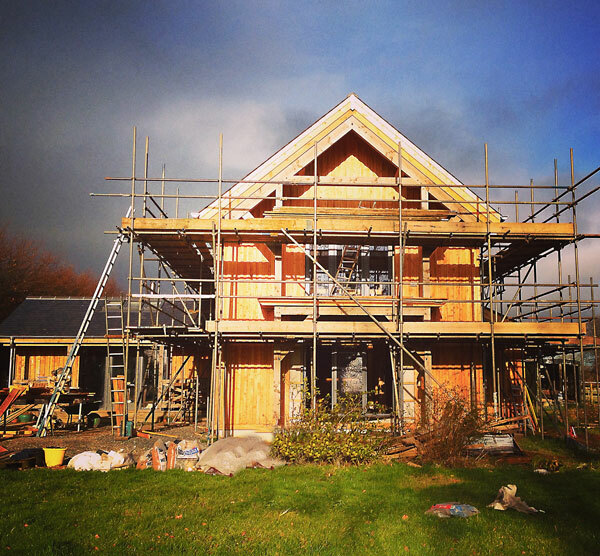 Our log store roof has 9.7 kW of PV panels on it. (We’ve just cut down the fence posts because they were shading the panels. You may only have 5% shading, but that can knock out 80% of the output). Below is a photo of one of our three Inverters. 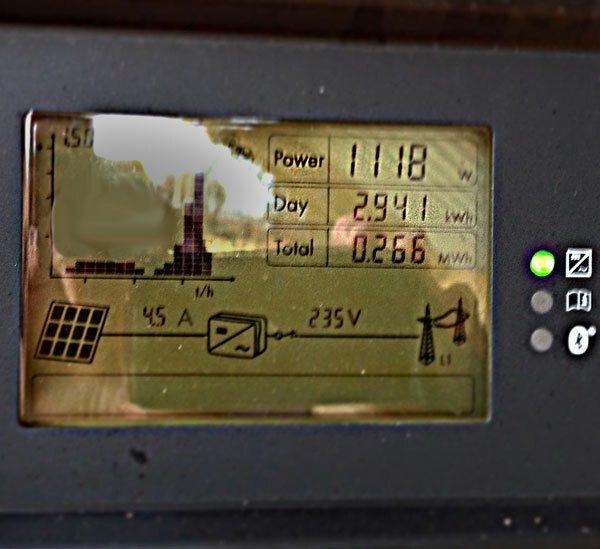 At this instant (late morning today), one inverter is harvesting 1.1kW. We have 3 inverters, so rough estimate, the whole array of panels is producing 3.3 kW at that moment. We have three, 3kW inverters, so in theory we could harvest 9 kW in full sun. But the amazing Sunny Island can only harvest max 6 kW at a time. 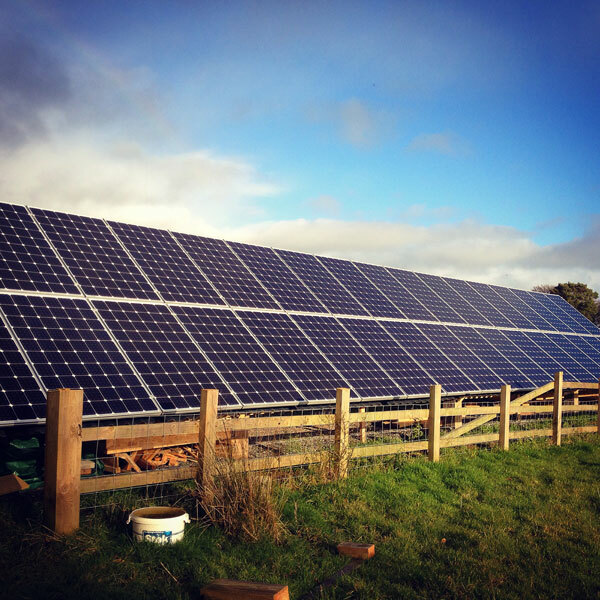 So – Winter Sun and a 6kW bottleneck. How are we doing? After mid-day when the sun had been blazing for a few hours, I went to see how the batteries were doing. This says that at 1:30 pm (the Sunny Island started life during BST, so the time on the monitor is GMT + 1), 5.1 kW is going into the batteries. Just two days shy of the shortest day of the year. Not bad. If we didn’t have the bottleneck we could have been harvesting closer to 9kW at that moment in time. What does that mean for battery percentage? 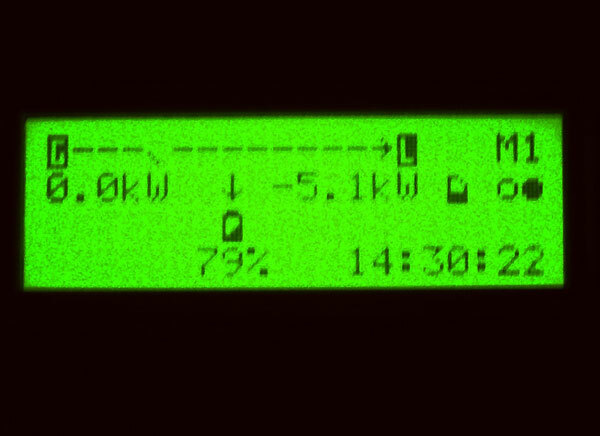 In our system, based on our daily records, it appears that 1% = 1 kW going in. So today we went from 70% to 80% in 2 hours. Consistent with harvesting 5kW times 2 hours. If we didn’t have the bottleneck and we’d have harvested 9kW x 2 hours, we would be at 88% capacity and I might have run the dishwasher. Not a tragedy and anyway, tomorrow is another day.